So you’ve booked a venue for your party or wedding reception. The room is okay, except for these ugly exposed air ducts right where you wanted to put the cake table. Pipe & drape, also known as “those black booths you see at trade shows,” can help. All the pipe & drape that we carry at DeeJay’s is made from thick, shiny, semi-transparent “Banjo” fabric. We have black, of course, but we also carry a deep red, champagne, and pure white. 1. How high are the ceilings? 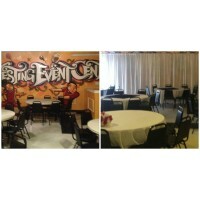 We carry various heights from 8′ to 13′ pipe & drape. While it is adjustable horizontally, we cannot make it shorter. 2. Is what you want to cover okay to cover? Banquet halls generally frown on covering fire doors. You also shouldn’t cover a door that your guests or the waitstaff are going to be using during the event. 3. The pipe & drape needs to be disassembled before the event. It’s not a good idea to try to move it halfway through the party. You can tie the drapes back to the poles. 4. You can turn pipe & drape from a cover-up to an accent wall with the addition of some linens. Some customers rent our linens and drape them over the pipe & drape. Tent Accessories – What you need, what you don’t Throw your own St. Patty’s Party!